Who Wants to be a Millionaire is a slot from the company Big Time Gaming, which combines the subject of a television show and gambling components that provide major victories at the rates of the main mode and bonus. The last format of the draws involves a special profit, since it uses constant factors. If you appreciate the appearance of the slot game Who Wants to be a Millionaire, then you should note the complete similarity with the original program. Such results were achieved thanks to cooperation with the owners of copyright. The collection of symbols, which include ordinary jewels and maps, as well as additional Wild and Scatter, adds even more individuality to the slot. The chances of success in this slot machine will depend on the right decisions to be made before starting the free spins. As for the total return, it is high here, so low stakes are suitable for playing the slot. The Who Wants to Be a Millionaire slot became one of the most anticipated BTG video slots in 2018. 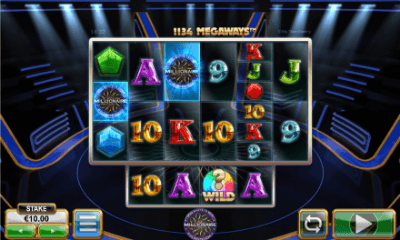 The signature feature of the Who Wants to be a Millionaire gaming machine is the Megaways system, which rebuilds the drum cells in such a way that a different number of lines for lines is involved in each round. Also, Megaways technology involves payments for a huge number of winning combinations (more than 117 thousand options). Another surprise for the participants will be the disappearance of winning symbols. This action connects the slot every time a winning combination is formed and can continue indefinitely. In the free spins process, the Collapsing Reels function increases the values of the multipliers. The multipliers are activated in the free spins mode, when the participant of the Who Wants to be a Millionaire has completed the preliminary stage. They start from x2 and are not limited as long as the same matches on the slot reels. Standard symbols in the video slot are images of precious stones. Their player will have to collect on the six reels of the gaming machine with a different number of characters on different reels. The size of bets per spin can vary from 0.2 to 20 coins, and the coefficient per set of six most expensive gems is x50. However, the greatest interest and much higher multipliers are presented in bonus modes with free spins. The bonus game Who Wants to Be a Millionaire starts after three scatter symbols appear on the reels in the form of a logo with the name of the TV show. The user is given the opportunity to take 8 free spins or take part in the fight for additional free spins. In the second case, you can earn up to 50 free spins or lose all bonuses. To get free spins, the player is required to select the correct hints (call a friend, 50 to 50, help from the hall), thereby moving up the table, which shows the number of free spins played. According to the developer, the maximum payout in this slot machine can reach 1 million coins with a maximum spin rate. Most likely, to get such a jackpot you will need to collect the most expensive combination while using the 50th free spin.